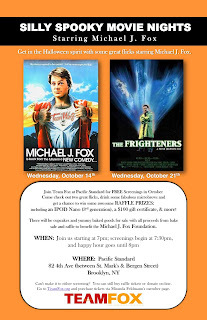 Charity movie nights on October 14 and 21. Moylan's Moylander Double IPA (Novato, CA; $7/12 oz). Here's the nice brewery description: "Moylander Double IPA is fat and resiny, with aggressive and excessive hops swinging on on an enormous malt backbone like naughty monkeys on a vine. Double malt, double hops--do the math, it’s academic." 8.5% ABV. Beer Nation Premiere Party Tuesday, October 6, 2009. As many of you know, our buddies Seth Wright and Mike Winn, with the help of Dakoit Pictures, have been developing a web-based series of short movies called Beer Nation that explores the craft beer revolution. After months of production, the first episode of Beer Nation will premiere on Tuesday, October 6, 2009 at Pacific Standard. It features Sixpoint Brewing and Pacific Standard, natch. Please join us for a rambunctious premiere party, which will culminate in a screening of the first episode. We're planning on showing the episode at 8:30 and 10:30 pm, but we'll play it by ear--basically, you'll be safe if you show up around 8 pm. In the meantime, stay updated on all things beer by visiting the Beer Nation blog. Also, if you're a member of Facebook you can join the Beer Nation fan page or group. Finally, psst--for the Beer Nation premiere, we'll be giving away some of our Sixpoint/Pacific Standard mashup t-shirts, among, perhaps, other things. It's a Tuesday that's definitely worth your time. Tentative NFL Schedule for Sunday. GABF Awards for Beers We Serve Here. Apparently the judges at the Great American Beer Festival, the biggest beer festival/awards ceremony in America, like a lot of the beers we have on tap. Here's a short list of beers we regularly serve here that won much-coveted GABF awards last week. Flying Dog, in addition to the beer awards you'll see below, won Mid-Size Brewing Company and Mid-Size Brewing Company Brewer of the Year! As you might expect, we'll continue to have their great stuff on tap. We're extending the Sixpoint Challenge! --If you drank nine or more Sixpoint beers during the course of the week, you still have until October 1 to get to 12 beers and earn your shirt. --You can drink any Sixpoint beers you want, even if they're repeats of beers on your list, or each other. For instance, if you have 9 Sixpoints already on your list, you can just drink three Sweet Actions to get to 12, or a Sweet Action and two Brownstones, etc., etc. Those of you who have completed the challenge but haven't picked up their shirts yet can come in any time to do so. Hope to see you 9+ people soon and reward you justly for your efforts. Cal beat Minnesota 35-21 last Saturday (with your gentle owners present and yelling themselves hoarse at the stadium), moving them up to #6 in the country, and setting the stage for two incredibly important Pac-10 games: at Oregon this Saturday at 3:30 Eastern time, and at home against USC the following Saturday at 8 pm ET. We'll have both games on our big screens, of course, and a hearty contingent of fans. We also donate a portion of game proceeds to Cal scholarship programs, so your drinking will do some good for some bright young students. In other news, we're showing plenty o' NFL games and lots of other college football action, without the madness and frattiness of other sports bars. Go Bears, and see you around soon. Next Chin Music October 1. Please join us for our next evening of Chin Music @ Pacific Standard. Arkansas, Sicily, and Belgium. She lives in Brooklyn, New York. teaches letterpress printing and writing, and works in a cheese shop. Fire at 80A Fourth Avenue. We just wanted to get the word out to those of you who haven't stopped by today or yesterday that our building and everyone who lives here, thankfully, are completely fine despite the fire next door on Monday. Also, our neighbors on the second floor next door made it out with only minor injuries. The property damage to the building, however, is pretty bad--everyone should consider donating to our AIDS Housing Network/Books Through Bars friends over there. We're taking up a collection here at the bar too, so come by anytime if you want to support a worthy cause. Finally, you can donate online at www.nycahn.org. Sixpoint Hops of Love (Brooklyn, NY; $6/16 oz). A West Coast-style IPA made in Brooklyn, Hops of Love is hoppy, light, and crisp, without an intense malty background. It's a hop bomb, yet carefully formulated so the bitterness doesn't come across too harshly. ABV unknown, probably moderate. Special Craft Beer Week beer now on tap. NY3 (Pleasantville, NY; $6/16 oz). The official beer of NYC Craft Beer Week 2009 is a collaboration between Captain Lawrence, Ithaca, and Southampton Publick House. A farmhouse ale brewed with local honey from each of the three brewers, it's dry-hopped with hops from Pedersen Farms, predominatly Willamette. ABV unknown, probably moderate. Friday the 11th: Sweet Action, Bengali Tiger (one of our three $2 Beer Week specials), Brownstone, and Righteous Rye. We'll also put a Sixpoint cask on soon, which will count as a separate beer, in order to assist people who might miss one of the beers that went on early in the week in completing the 12-beer challenge. Remember, if you drink 12 different Sixpoint beers during Beer Week (September 11-20), you get a limited-edition Pacific Standard/Sixpoint t-shirt. Last Topsham Pantsuit show Wednesday. Join us at Pacific Standard in Park Slope for Topsham Pantsuit: an apocalyptic evening of comedy, book cases, and craft beers. AND A SPECIAL GUEST??? OR TWO????? First two fiction readings of the season coming up October 13 and 27. Tuesday, October 13th, 7:00 p.m.
Lev Grossman's new novel, THE MAGICIANS, has been likened to "Harry Potter for grown-ups" by The London Times and to "poppin' peyote buttons with J.K. Rowling" by GQ. It is a New York Times Bestseller. His previous novel, Codex, has been published in 11 languages. Grossman, who lives in Brooklyn, is the book critic for Time Magazine. Hannah Tinti's bestselling first novel, The Good Thief, won the John Sargent Sr. First Novel Prize, and was named a Notable Book of the Year by the New York Times, which praised its "strong plotting, pure lucidity, and visceral momentum." Her debut story collection, ANIMAL CRACKERS, was nominated for the Hemingway Foundation/Pen Award. Tinti is the co-founder and editor-in-chief of One Story. If you're interested in drinking all twelve Sixpoint beers in the ten days of Craft Beer Week (September 11-20) to get a limited-edition Sixpoint/Pacific Standard t-shirt, we'd recommend stopping by early in the "week." We'll put four Sixpoint beers on tap on the 11th, and you don't want to miss one of them and lose out on the complete set. We'd say definitely come by from the 11th-14th to be sure you nail the first four. Then you'll have more time to finish the twelve; we'll be putting on one beer a day through the 19th. --Our college football package is in full effect. We have the ESPN GamePlan package, as well as all the Big 10 network games, and all the games carried on the Western regional networks. Basically, everything gettable is being gotten here. --We also have all the NFL games, and will be showing as many as we can on our two big screens starting Thursday, with Pittsburgh against Tennessee. --U.S. World Cup qualifier this Wednesday against the evil empire of Trinidad, which apparently has been joined by the equally nefarious Tobago in an attempt to defeat these United States. The ESPN coverage will start at 6:30 pm from Port of Spain, and we will have it, and a lot of fans, here. Join us for the island vacation; we'll have the usual $1 off all drinks special every time the U.S. scores. --Cal embarrassed Maryland by the ridiculous score of 52-13 last Saturday, and we all enjoyed it. Next up is Eastern Washington on Saturday at 5:30 pm, and if you think we won't have the game here, you're grievously mistaken. --Also upcoming is Cal's game against Minnesota on Saturday, September 19, at 12 noon. We'll open early, at 11:30 am (maybe even earlier), to let people get settled in and get drinks before the game starts. First Chin Music of the fall season on the 17th. Please join us for opening night of Chin Music’s Autumn/Winter 2009 season. On September 17th, we are excited to feature three fine poets: Randall Mann, John Casteen, and Will Dowd. Other writers to be featured in Chin Music this season include Alison Hawthorne Deming, Farrah Field, Major Jackson, Philip Levine, Roddy Lumsden, Wendy Mnookin, Akilah Oliver, and Monica de la Torre. Randall Mann is the author of two collections of poetry, BREAKFAST WITH THOM GUNN (University of Chicago Press, 2009) and COMPLAINT IN THE GARDEN (Zoo/Orchises, 2004), and co-author of the textbook WRITING POEMS (Pearson Longman, 2007). He lives in San Francisco. John Casteen was self-employed as a designer and builder of custom furniture for ten years after graduating from the Iowa Writers' Workshop. He has taught at The University of Virginia and at Sweet Briar College. He has contributed poems to The Paris Review, Ploughshares, The Southern Review, and other literary magazines; he has also written for Slate.com and Virginia Quarterly Review, where he serves on the editorial staff. His book, FREE UNION, appeared this spring from the University of Georgia Press. He lives outside Charlottesville, Virginia, with his wife and their two young children. Will Dowd's work appeared recently in 32 Poems, The Comstock Review, and Post Road Magazine. He received a B.A. from Boston College and an M.S. from MIT. In 2007, he was named a Jacob K. Javits Fellow. He is currently pursuing an MFA at New York University.